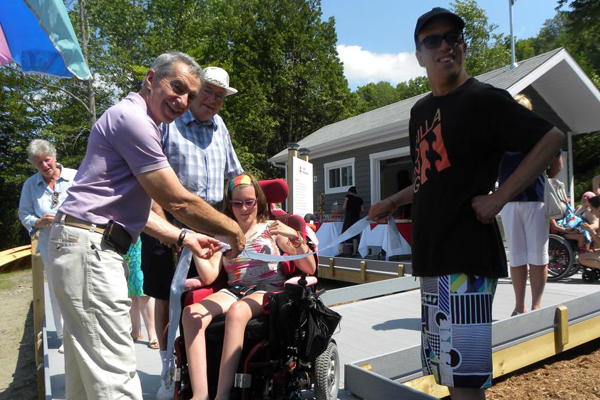 The inauguration of the new terrace at Camp Massawippi. I am regularly told that I am lucky to be in such a fabulous profession. Being responsible for the donations and sponsorships program of a company that has the heart to give back to its community is indeed a sense of great pride and privilege. Despite the significant economic issues at stake in our industry, despite the difficult choices that our donations and sponsorships committee has to make, despite the thousands of requests that we have to assess and the numerous refusals that we have to explain, there are moments when I realize that I would not want to be doing any other job. This happened on July 17. In the company of Laurent Lemaire, co-founder of Cascades and Robert Hall, Vice-President of Legal Affairs, I attended the inauguration of the new terrace at Camp Massawippi. The one I now take pleasure in calling the terrace of happiness…an enduring happiness for camp leaders, because it was built with our Perma-Deck boards. Made of 100% recycled plastic, the use of these boards will reduce maintenance work for staff because they require no particular care…other than a bit of soap and a pressure washer for cleaning! Located in Ayer’s Cliff in the Eastern Townships, this summer camp provides a wide range of programs for children and young adults with a physical, hearing or visual impairment. This terrace is therefore, for them, a direct access to the beach where they can take advantage of numerous summer activities, such as adapted water-skiing! I must admit that I wiped away a few tears when we watched a demonstration of this sport. 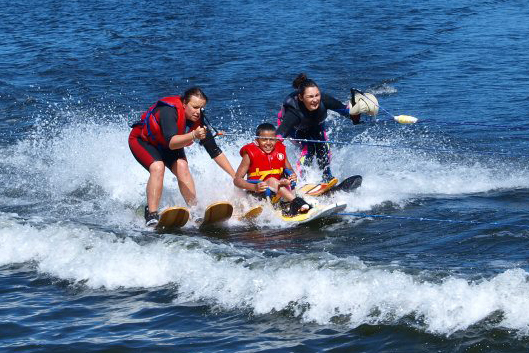 I had no idea that handicapped persons could water-ski. In-between two monitors, a young boy was enjoying the sunshine and the lake, having fun and laughing when he “would come out of the water”, being pulled by the boat. This equipment, provided by Opération Enfant Soleil, and this supervision by dedicated monitors, allowed him to take a ride like any other skier….very touching to a mother’s heart. Philanthropy produces small wonders and it is inseparable from generosity. As a company, we made a small difference that day, by enabling the construction of an attractive terrace which provides access to numerous aquatic activities for those children and young adults, who are models of determination and courage. From my perspective, I realized that over and above donations, there was a very strong component, which was love. The love of caring staff who participates and looks out for the welfare of others: a vocation much more than just a simple job. Young monitors, most of them students in health sciences, special education, occupational therapy or nursing, who could have chosen a less demanding summer job to earn their money and finally, the MAB-Makay Foundation which ensures that this mission which they have been defending for more than 60 years, will still be around for many years yet. I can assure you that on that day, I would not have wanted to be anywhere else.